Teen Reviews presents book reviews and recommendations from teens in Mesa County. Don’t be surprised if you can’t find some of the books mentioned in these posts at the library or in stores: teens who attend Teen Book Club on Wednesdays at 4:00 at the Central Library have access to books before they are officially published. 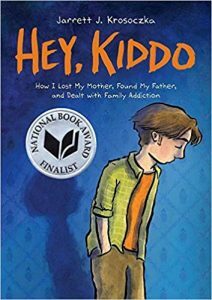 The story was very good at expressing the feelings of a kid who never really had a mom or a dad. I think that the art style is amazing; but I really don’t like the comic stripe way that the book was written in. The story is very inspirational and it brings to light the issues that some kids have to face in their very own homes. All in all “Hey, Kiddo” brings to mind a lot of my friends who have struggled through this type of situation. It will make you ponder about what a real family should be and shows that even if you have the title of mother or father it takes a lot more to be a parent. Posted in General, Reviews and Recommendations, Teen Reviews, Teens.